Here’s a poached pear recipe for the whiskey lover, which combines bourbon and sweet Indian spices in the poaching liquid. The flavors are deepened thanks to a quick steep of the spices before the pears are added along with a reduction of the sauce as a finale. 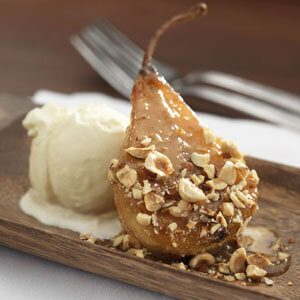 Serve these poached pears in their own rich sauce with a scoop of coconut gelato. In a large saucepan with a lid, combine the water, bourbon, and dry spices, and ginger and bring to a simmer. Stir in the honey and vanilla (including the pod), and set aside to steep for 30 minutes. 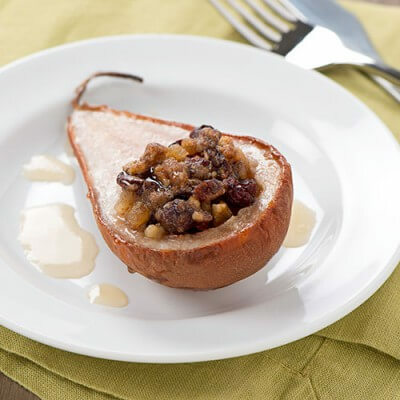 Once the mixture has cooled slightly, prepare your pears by peeling, quartering, and scooping out the core with a melon baller. Place the pears into the liquid, being sure they are fully submerged. Place the pot over medium heat, cover, and bring to a simmer. Once simmering, reduce the heat to low, cover, and cook until the pears are just tender when pierced with a fork, about 15 minutes. Check on the pears occasionally to be sure they are submerged, gently stirring if necessary. Remove the pears from the liquid and set aside. Increase the heat and bring the sauce to a boil. Continue to boil for 10-15 minutes, or until the mixture is syrupy. Strain the sauce to remove the spices and pour over the still-warm pears.